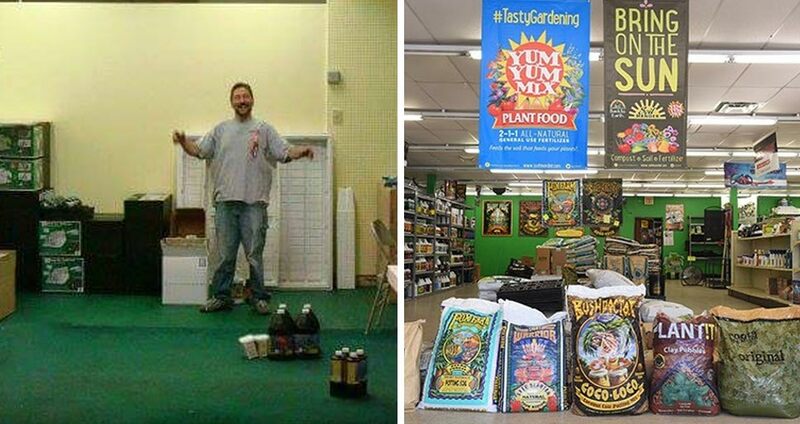 Just about 9 years ago to the day, Marc and Janine Bradley started Organics OKC Garden supply store. If you can corner Marc for a few minutes out of his busy day, he would tell you it was mostly born out of frustration. So with a few hundred dollars in his pocket, Marc set out to open the business that everyone knows today. In the beginning, it was very tight quarters in the original store and a passion to make a difference in the growing community. That desire to make a difference has been driving force behind Marc and Janine Bradley’s long relationship with this community. In the early days of the grassroots efforts to change the laws here in Oklahoma, Organics OKC opened their doors to the community. Activists meet there to turn in petitions and talk about current efforts starting with the decriminalization petition and others. Organics OKC hosts different types of informative hands-on classes throughout the year as well, so if you’re new to gardening don’t be afraid to get your hands dirty because Marc, Janine, and their staff are there to help you out. The staff at Organics OKC is also hardworking and dedicated ready to help you with all of your growing needs. Several of the employees working there are also students at OSU-OKC in various botany or horticulture areas of study. So if you need some tips on growing, be it Cannabis, produce or ornamentals, just stop on by and say hello. You’ll be stepping into the longest running grow supply store in Oklahoma City and chances are you will be greeted by Janine with a warm smile and a friendly “Welcome to Organics OKC” Depending on whose in the shop at the time you may get to visit with some of the local farm owners and learn some lessons from the pro’s.